Map of the planned expedition operating areas. Image courtesy of the NOAA Office of Ocean Exploration and Research. Download larger version (439 KB). Prior to the start of every field season, the NOAA Ship Okeanos Explorer team dedicates a series of days at sea to "shakedown" the ship's mission systems. During the shakedown, all of the systems undergo rigorous tests to ensure they are performing properly and are ready for the rest of the year. This year’s system shakedown cruises are particularly important because during the winter repair and drydock period, a number of new systems were installed on Okeanos Explorer, including seven new sonar systems, a new VSAT, and a new navigation system for our remotely operated vehicles. The first shakedown cruise took the ship from drydock in Alameda, California, to port in Honolulu, Hawaii. From February 12 to February 17, the team will continue to shakedown the newly installed systems, test data work flow and integration, and prepare for the rest of the field season. 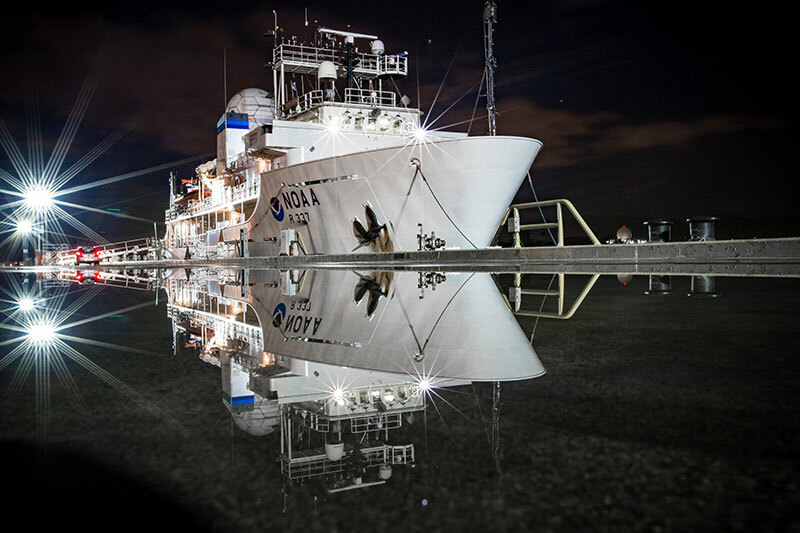 The remotely operated vehicles (ROVs) met the ship in Honolulu, so a primary objective of this cruise is to test the ROVs in a controlled environment and train new ROV engineers. 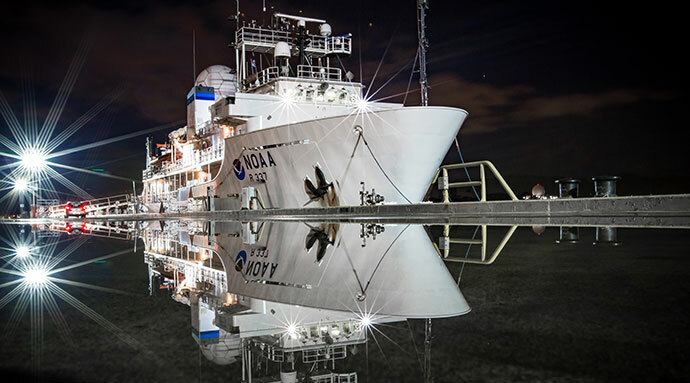 Mission activities will consist of 24-hour ROV and mapping operations, with a primary focus on completing engineering priorities and testing new systems. Exact locations of discrete ROV dives and mapping activities will be determined during the cruise, as results of engineering and shakedown tests are evaluated and once weather and operational constraints are factored in. As time and completion of priority objectives allow, operations will collect data in support of the Campaign to Address Pacific monument Science, Technology, and Ocean NEeds (CAPSTONE). 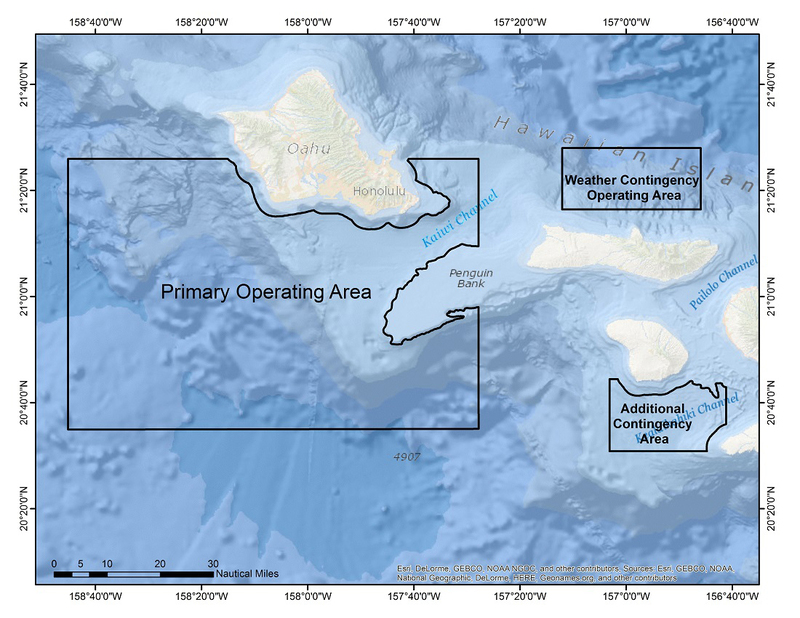 CAPSTONE is a three-year initiative to collect baseline data critical to NOAA science and management needs in largely unknown areas of U.S. waters in the Pacific. The campaign serves as an opportunity for NOAA and the nation to highlight the uniqueness and importance of the Pacific Monuments and Sanctuaries, which are national symbols of ocean conservation. NOAA Ship Okeanos Explorer alongside in Honolulu, Hawaii. Image courtesy of the NOAA Office of Ocean Exploration and Research, 2015 Hohonu Moana. Download larger version (9.7 MB). During shakedown operations, the Okeanos Explorer team run’s the ships scientific sonars through a series of rigorous tests designed to catch any glitches. Okeanos Explorer has four types of sonars onboard: Kongsberg EM302 multibeam sonar, EK60 split-beam fisheries sonars, Knudsen 3260 chirp subbottom profiler sonar, and Teledyne RDI Workhorse Mariner and Ocean Surveyor Acoustic Current Doppler Profilers (ADCPs). During the winter drydock, five new EK60 frequencies were added to our sonar suite. These additional frequencies can detect water column anomalies at various scales. When operated together, the sonars provide a full profile of the midwater ecosystem, increasing our ability to explore and understand the water column. The ADCPs will help us understand deep water currents, a poorly understood aspect of the deep-sea environment. Also installed this winter was an Underway CTD system which will allow the mapping team to efficiently collect sound speed profiles that are applied to the raw multibeam sonar data. The centerpieces of Okeanos Explorer’s telepresence-enabled exploration operations include NOAA’s two-body, 6,000-meter rated, ROV system (ROVs Deep Discoverer and Seirios), integrated in 2013, and the ship’s high-bandwidth satellite connection for real-time ship to shore communications. These sophisticated systems require constant maintenance, fine-tuning, and upgrades performed by our talented team of multidisciplinary engineers to keep them at peak performance. During the shakedown expedition, ROVs Deep Discoverer and Seirios will be deployed to various depths and increasingly complex topography. During descent, all systems will undergo full checks as the pilots assess that everything is running smoothly. 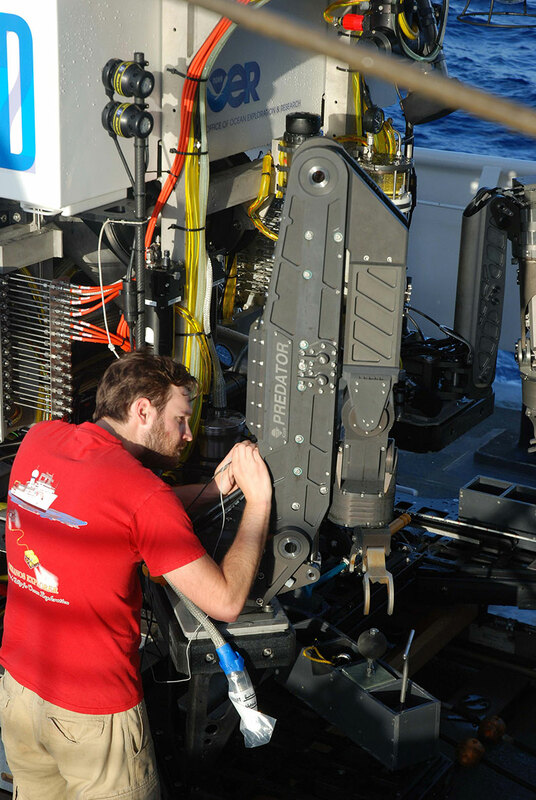 Once the ROVs reach bottom, the team will perform a series of strategic manipulations to assess and troubleshoot the mechanical, electrical, and software systems. The pilots will also complete cross-training objectives and allow new personnel to familiarize themselves with the ROVs. Aside from running through normal operations and stress-testing the vehicles, our engineering team will also be integrating and calibrating a new USBL (Ultra Short BaseLine) system, which provides position information of the ROVs. Additionally, the new VSAT (very small aperture terminal) satellite dish, which allows the high bandwidth connection to shore, will be fine-tuned. Both of these systems are critical to Okeanos Explorer operations and were installed during the winter drydock period. During the expedition, our team of engineers will shakedown systems as well as make any repairs and adjustments that are needed to ensure everything is prepared for the rest of the field season. Image courtesy of the NOAA Office of Ocean Exploration and Research, Océano Profundo 2015: Exploring Puerto Rico’s Seamounts, Trenches, and Troughs. Download larger version (2.0 MB). A significant amount of the expedition will focus on training new members of our team on the existing systems and familiarizing everyone with the new systems. 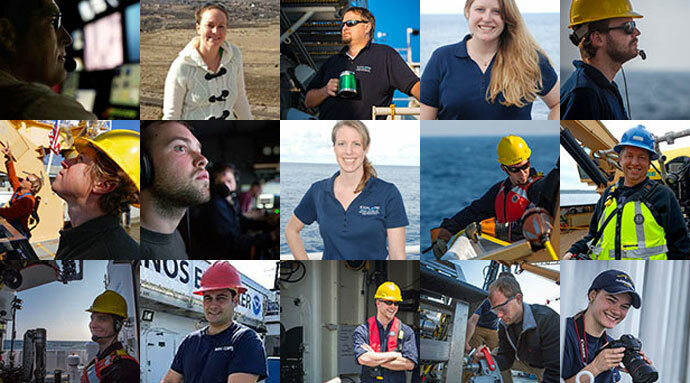 This expedition we have new ROV pilots, mapping watch leads, and ship crew members. Every day our team will walk through the standard protocols, allowing new personnel to get a feel for how we conduct operations. New ROV personnel will rotate through a number of different positions so they can learn as much as possible during the shakedown expedition. As our operations often take the ship far offshore, it is critical that personnel understand all aspects of operations so that if there is a malfunction during an expedition, our team is able to identify, troubleshoot, and solve problems as they arise. The 2016 Okeanos Explorer field season is shaping up to be one of the most exciting years yet, but before it gets underway, we will spend time making sure every system is fully prepared for regular telepresence-enabled exploration starting February 23. The rest of the field season will take Okeanos Explorer to very remote parts of the Pacific, so it is critical that we have tested all mission systems, provided ample training for new personnel, and double checked that all equipment is prepared for the over 6,000-mile journey that is ahead.